What you carry with you to work says as much about you as what you wear. You want to make the right first impression on the people you meet, colleagues, clients or employees. If you are a manager of a department your worn out backpack may make you look more like an ageing student. 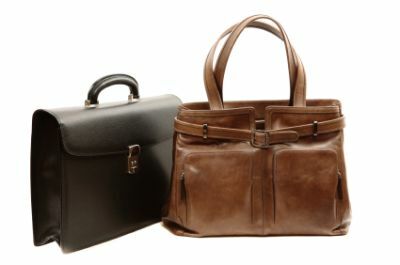 A good quality leather briefcase will keep all your important documents safe and tidy, or a smart handbag or manbag. In this hi-tech era you may also need to take a laptop with you to work or meetings and presentations, so a professional bag with suitable shoulder support is a must. For women, when choosing the right work handbag you need to ensure that you can fit what you need into it, but don’t buy a large bag or overfill it. Carrying a heavy bag can cause back problems, joint pain, strains and even headaches. To prevent this make sure you have correct posture and evenly distribute the items in your bag, you should also move your bag from shoulder to shoulder to give each side a break. Investing in a good quality work bag or briefcase will pay dividends in the end, you will portray the right image along with protecting your shoulders and back as much as possible. This entry was posted on Tuesday, July 14th, 2009 at 1:58 pm	and is filed under Office Etiquette, Office Talk. You can follow any responses to this entry through the RSS 2.0 feed. You can leave a response, or trackback from your own site.